SPACEPORT NEWSPage 3 Jan. 5, 2001MarsPort 2001 competition spawns ideasAlthough it may be years before humans are sent to land again on the Moon or for the first time on an asteroid, Mars or another planet, NASA is already considering what technologies will be needed to get astronauts to those destinations and back safely. Various scenarios for transport, landing and return are being explored by planners, scientists and engineers. To help spur creative solutions to specific technology challenges in one such scenario, Kennedy Space Center is partnering with Florida Space Grant Consortium and Texas Space Grant Consortium to sponsor the MarsPort 2001 design competition. Universities across the nation were asked to submit their conceptual design for a propellant and life support production system to be used on the surface of Mars. Such a system would be sent to Mars ahead of the first manned mission so that the consumables would be produced, stored and made ready for use to assist astronauts during their stay and return from Mars. The conceptual designs of six university teams were recently selected by a group of judges, engineers from KSC and Johnson Space Center. The chosen student and faculty teams represent Embry-Riddle Aeronautical University, Cornell University, University of Wisconsin at Madison, Georgia Institute of Technology, University of Tennessee at Knoxville and George Washington University. Now those teams are working on an engineering analysis and detailed designs of their concepts. The final designs will be judged for merit in May. We received some extremely creative entries and were looking forward to seeing how the university teams work out the details, said Mike ONeal, NASA exploration lead from KSCs Spaceport Technology Business Devel-An artist  s conception of the MarsPort of the future. In one exploration scenario being considered by NASA, a propellant and life support production system would be sent to the surface of Mars to begin production before the first humans arrive. To help spur innovative designs for such a system, Kennedy Space Center is partnering with Florida Space Grant Consortium and Texas Space Grant Consortium to sponsor the MarsPort 2001 design competition.opment Office. Were looking for innovative ideas and out-of-the-box thinking. These student and faculty teams have access to ideas about emerging technologies and they can incorporate those into their designs. The competition was created to generate ideas that can benefit the space program both now and in the future. At Kennedy Space Center in particular, we are always looking for new ways to improve our processes in the liquefaction, storage and distribution of propellants, so looking at what would be required for such a system on Mars is an analogy KSC can leverage its skills on, ONeal said. Another purpose of MarsPort 2001 is to introduce students to the space program and its career potential, said Sam Durrance, director of the Florida Space Grant Consortium. This is an invaluable experience for students to do some hands-on design work on a real-life engineering challenge, Durrance said. In addition to designing the system, the teams are required to publicize their projects to help educate others. Representatives of the teams will visit KSC in May to tour the Center and to participate in a final defense of their systems design. STS-98 ...(Continued from Page 1)supplied to NASA by the Italian Space Agency. Thirteen of Destiny's racks are specifically designed to initially support experiments in microgravity and life sciences. Eleven will house the systems and resources required for supporting the Lab, such as power, cooling water, temperature and humidity control, communications and tracking equipment, and air revitilization for removal of carbon dioxide and replenishment of oxygen. One of the racks will be used specifically for health maintenance of the crew and the control racks will be used for Canada's mobile servicing system. The U.S. Lab's first science facilities include the Human Research Facility  where scientists will assess crew health and how the human body responds and adapts to microgravity; the Fluids and Combustion Facility  where experiments will be conducted to study the uses of microgravity for improvements in production of semiconductor crystals, glass fiber and energy; the Biotechnology Facility  where research will be conducted for improved engineering and technology on protein crystal growth in microgravity for the development of more effective medications; the Materials Science Facility  where scientists will study the atomic and molecular structures of materials in microgravity; and the Optical Window Rack Facility  where crews will utilize the highest quality optical glass ever used for testing in space through the use of cameras, sensors and other devices employed in the identification of pollution sources and monitoring of environmental conditions. Members of the crew are Commander Kenneth Cockrell, Pilot Mark Polansky and Mission Specialists Robert Curbeam, Thomas Jones and Marsha Ivins. Page 4SPACEPORT NEWSJan. 5, 2001 KSC Christ m Kennedy Space Center team members gathered at the KSC Visitor Comple x Space Education Building on Dec. 12 for the annual KSC Christmas Coffee. event was well-attended by KSC employees and retirees. 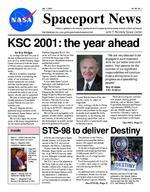 Page 6SPACEPORT NEWS Jan. 5, 2001Traditional Holiday DinnerNASA  s Traditional Holiday dinner was held at KARS Park I on Dec. 13. The event, held for NASA civil service personnel, was sponsored by the Combined Federal Campaign Victory Committee and the Change Leaders Network. The NASA Exchange council funded the event. It was catered by Delaware North Park Services. John F. Kennedy Space Center Managing editor. . . . . . . . . . . . . . . . . Bruce Buckingham Editor. . . . . . . . . . . . . . . . . . . . . . . . . . Kathy Hagood Editorial support provided by InDyne Inc. Writers Group. NASA at KSC is located on the Internet at http://www.ksc.nasa.govUSGPO: 533-128/00048Spaceport News Spaceport News is an official publication of the Kennedy Space Center and is published on alternate Fridays by the Public Affairs Office in the interest of KSC civil service and contractor employees. Contributions are welcome and should be submitted two weeks before publication to the Media Services Branch, XAE-1. E-mail submissions can be sent to Katharine.Hagood-1@ksc.nasa.gov Page 8SPACEPORT NEWS Jan. 5, 2001 January Employees of the MonthJanuary employees of the month are pictured from left to right: Jim Herndon, ELV and Payload Carriers Program; Carol Scott, Shuttle Processing Directorate; Cathy Deane, Safety, Health and Independent Assessment Directorate; Christa Casleton, Chief Financial Office; Dave Wilson, Workforce and Diversity Management Office. Employees of the month not pictured are James Belote, Spaceport Services Directorate; and Tommy Mack, Spaceport Engineering and Technology Directorate.PETTIT ...(Continued from Page 2)A. We are already moving towards a stronger and larger partnership with KSC. Last June, Mr. Bridges and I signed an agreement that established the Joint Planning and Customer Service Office. Like the JPMO, this new office is staffed with both Air Force and NASA civil servants. Soon, we hope to formally add the State of Florida to the office. One of the major responsibilities of this new joint office is to help us collectively plan for the future Spaceport. We are already working on a joint 50-year comprehensive Spaceport master plan that integrates the needs of all major stakeholders, not just the Air Force. This new office will be working to streamline business processes between our two agencies from strategic planning, customer support, policies and even changing some laws. I would not be surprised if this new concept spins off more joint AF/NASA offices. Q. What is your vision for the future of the Spaceport? A. I foresee, someday, that ours will be only one of many spaceports around the world. Technology will improve to make spacelift much more affordable and accessible not only for the military, NASA and commercial industry, but also the private citizen. We will be able to travel on business or recreation anywhere in the world within two hours. Our grandchildren will go to Cape Canaveral Spaceport to board a shuttle cruiser to low-earth orbit for their honeymoon. We have the opportunity here to prototype the future spaceport. I believe it will be modern, economical and user-friendly, conducting several spacelift operations every day. Above all, we will be the premier spaceport in the world. Q. How will KSC and the 45thSpace Wing work with its other partners to make that a reality? A. We are already going in that direction with the establishment of our Joint Planning and Customer Service Office. A principal mission of this joint Air Force/NASA/State office is to facilitate and integrate development of our future Spaceport. They are working hard to plan for our future and to streamline or reengineer, if necessary, our business processes to bring our agencies business operations closer together. The new forum that we will use to do this began about a year ago when Mr. Bridges and I established a joint board known as the Cape Canaveral Spaceport Board of Directors. The Board has a broad scope that includes providing leadership oversight to our two joint offices, the JPMO and the JPCSO. The Boards membership includes advisors from the Spaceport Florida Authority, Enterprise Florida, a new industry-lead group called the Florida Space Commerce Board, and a State-sponsored academia and the Florida Space Research Institute. As you can see we have a broad structure set up to address customer issues, joint planning and joint base support operation. The Board also oversees another new customer advocacy forum known as the Customer Focus Team. The mission of the Customer Focus Team is to partner with commercial industry and the State of Florida to enable safe, worldclass launch processing, payload processing, test, launch, and technology development and support services. The Teams Customer Advocates seek out customer input and feedback to focus the Spaceport on those areas of concerns that mean the most to our customers. The Teams Process Owner champions are partnering with the Customer Advocates and the customers themselves to design and implement improvements across the Spaceport. The teams have only recently begun their work on five high priority areas of interest to our customers. Another forum that we are using to partner with KSC and Florida is our annual Cape Canaveral Spaceport Symposium. We just held our sixth symposium on Nov. 14 and 15. The symposium focuses on two-way communication between all Spaceport stakeholders on areas of interest to them. Overall, I was very impressed by the stimulating discussions from the panels and guest speakers. We have come a long way in the last two years and this great team spirit will guarantee an exciting future for the Cape Canaveral Spaceport.